This entry was posted in collectibles and tagged die-cast on September 2, 2011 by James Day. Last month we featured the Hot Wheels 2011 MINI CHALLENGE die-cast car. Now Hot Wheels has released a classic Mini for 2011. Hot Wheels has released its 2011 Track Stars series and it includes this Morris Mini die-cast model. 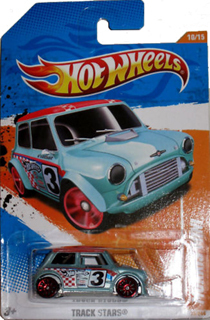 The Morris Mini model is teal with a red roof and wheels and with the number 3 and graphics on the sides. The Morris Mini is number 10/15. It comes on collector card number 75/244 in both long (shown) and short card size. See other Hot Wheels and other die-cast MINIs and Minis.